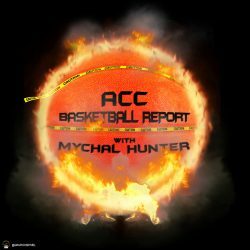 ACC’s Top Returning Players: #13a Kerry Blackshear Jr. So here is the fun about running your own site. You can do whatever you want. I couldn’t decide when making the list who I liked more in this slot, Blackshear or the entry that will be released later today, so I just did both, called them 13a and 13b and that gave me more slots for players. We have back to back Hokies folks, number 13: Kerry Blackshear Jr.
That video shows so much. The man has good hands, good touch from the outside, gets great position on the block and plays the pick and roll very effectively with Justin Robinson. Blackshear’s versatility is what makes him so good. He is not a great three point shooter, but he does shoot 30% so you have to guard him. If you look at his per 40 minute averages, he should be a star, averaging 20 and 9 per game. The problem is, and always has been, that Kerry just cannot stay out of foul trouble. Over the course of his career he has averaged over five fouls per 40. In fact, Blackshear led the league at a foul per 7.91 minutes played last year (min 800 minutes played). He has fouled out of 13 games in the past two years and had at least four fouls 11 times. It’s not necessarily due to bad positioning or being over matched as much as mental lapses. Miss a layup, hack the rebounder. Get boxed out on the offensive end, shove the defender out of bounds. This is particularly concerning considering that once again Blackshear is literally the only post player that the Hokies have that is an ACC caliber player. Khadim Sy has once again left Buzz Williams high and dry and PJ Horne will more than likely serve as Blackshear’s backup once again. If you only look at the box scores or per game averages you won’t exactly be blown away. Blackshear averages a pretty pedestrian 12.5 points and 6 rebounds per game. The way he fits Buzz Williams’s offense is almost perfect however. He can pick and pop, he can roll, he can float to the corner and pull the opposing big man out of the paint. This allows driving lanes for the four perimeter players stationed around the arc, all of which are both shooters and athletes. If he can just get the fouls under control, Blackshear has the ability to be one of the best big men the ACC and possibly all of college basketball. It’s just a matter of focus and conditioning.